For coffee and homemade walnut bread this is a 6 out of 5. No espresso however they can make your coffee very strong if you ask. They have a number of different coffees to choose from. Best coffee I’ve had in a long time. $3. for 12 ounce and $3.50 for 16 ounce coffee. 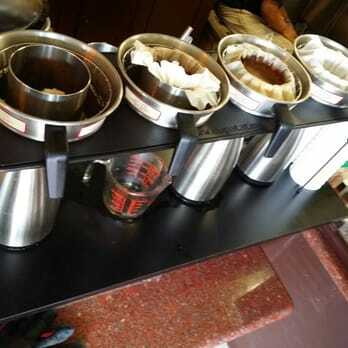 All coffee is individually ground fresh, hand dripped and then hand aired. Only 4 seats inside & 2 seats outside so mostly to go and not a sit down type of place. Each individual coffee is freshly ground, then dripped into thermos bottles and then aired (coffee poured back & forth in cups).